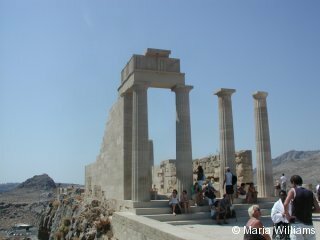 The energy of ancient civilizations is still felt when you take a trip to Lindos, Greece. Traveling to the city transports you back into time. 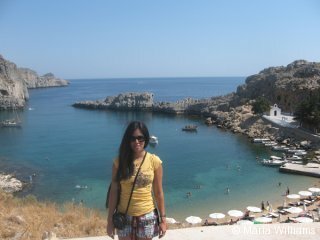 I visited Lindos in September 2008, traveling with a group that included my in-laws and extended family. At the time of the trip, my husband and I were still dating so the trip allowed me to get better acquainted with his family. My husband’s family on his mother’s side is from England, so we flew from England to Greece. As soon as you land, you immediately feel the heat. On the way to our rented villa, we took in the arid landscape, as well as some of the local livestock. At times, we encountered goats alongside the road. 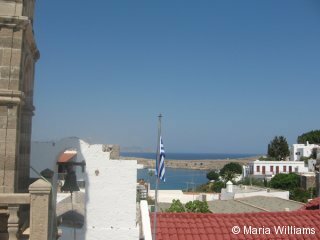 The villa was situated close to the ocean and provided views of a breathtaking horizon. 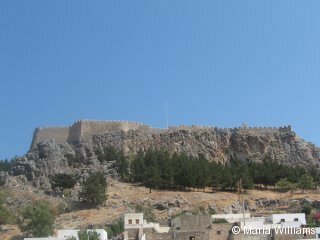 We stayed close to the town of Lindos, which is one of the finest and oldest villages in Greece. 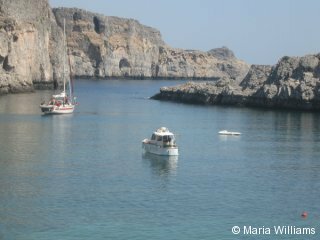 The small town of Lindos offers the sights of attractive cobblestone roads and ancient architecture. The floral and ornamental floor patterns throughout the city are truly beautiful. The floors inside of the marketplace are stunning. This area was filled with shops, restaurants, cafés, and bars. 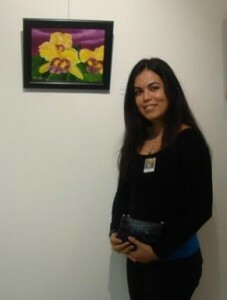 They also had artwork for sale. I’d also like to mention that inside the city, you don’t encounter any vehicles – except for service cars. I enjoyed the Greek cuisine of the city, especially the gyros and crepes. This was the first time I had ever tasted both. 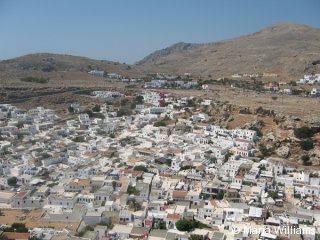 In Lindos, we visited the Greek Orthodox Church. In order to enter, the church provided me with linen to use as a long skirt. 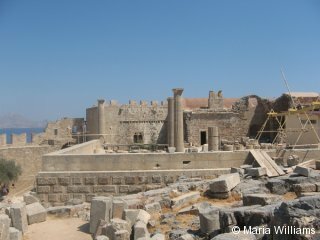 Dominating the western and highest part of the city, we visited the Rhodes Acropolis. In order to enjoy this attraction, we experienced a long uphill walk. You can also rent donkeys to reach the site, but we decided to travel on foot. Along the way, we encountered artisans selling beautiful linens. Once we reached the top of the hill, ancient ruins surrounded us. It was like traveling back into time. This region is very hot with the occasional refreshing wind and breeze. From this point, we enjoyed spectacular views of the city and ocean. It was here, at the Acropolis in front of the Temple of Athena, where my husband proposed. This is one of the most memorable moments in my life – when he kneeled down and asked me to marry him. 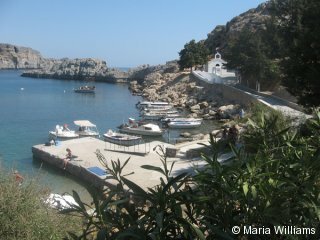 Next to the town, you will find this beautiful beach. 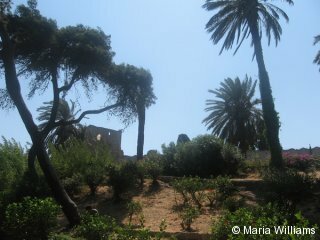 What really caught my eye was the long, narrow trail beside the beach that led to a small church. During our visit, we had the chance to see a bride walk down the path to the church. Greek music heavily relies on string instruments that produce a jovial sound. We enjoyed live, traditional Greek music at one of the restaurants we visited for dinner. The musicians and dancers wore traditional Greek clothing. While there, visitors and tourists are encouraged to join in their dance. We really had a fun time. 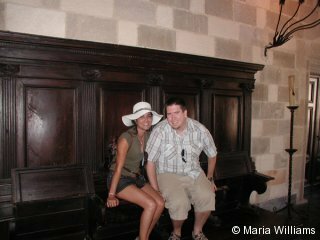 On our trip, we visited the Palace of the Grand Master of the Knights of Rhodes. This attraction is filled with a lot of history, art, mosaics, and striking architecture. During ancient times, the city of Rhodes was home to one of the Seven Wonders of the World – the Colossus of Rhodes. Completed in 280 BC, the giant bronze statue was destroyed in an earthquake in 224 BC. Although I looked and looked, there is no remaining trace of the statue today. Visiting this destination made me feel in touch with the past.